So I may have cheated a little and have already made the sauce in my Chicken & Chorizo Parmigiana recipe. But hey, there’s nothing wrong with making things easier when you’re hard pressed for time like I am with two little rug rats. Like most of my recipes, this ones a doddle! Bring to the boil a medium saucepan with water. Once boiling add a pinch of salt. Bring the pasta sauce to a simmer. Slice the panini’s in half, butter each side and full with crushed garlic, parsley and half the shaved Parmesan. Place them in a sandwhich press until cooked. Once the pasta is cooked, drain the water, add in the pasta sauce and serve. 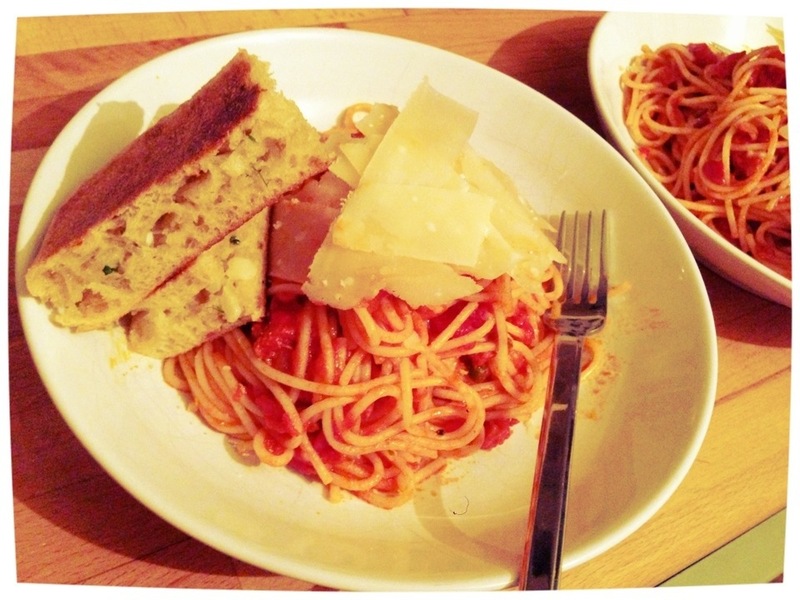 Shave over the remaining Parmesan cheese and take to the table with the garlic bread. Enjoy with a nice glass of red wine. Oh… I found there should be more of the sauce left over. So why not use the remaining as a topping on some hot potatoes with some sour cream. This entry was posted in Kitchen Creative and tagged bread, chorizo, Cooking, garlic, Leftovers, pasta, quick, recipe, simple by whysamiam. Bookmark the permalink.